Tower Tech Services is dedicated solely to cooling towers. Thus, TTSI is your first choice when considering replacing your cooling tower. Our crews are specialize in nothing but cooling towers, hence your replacement is performed by a professional crew well versed in the project at hand and the replacement is done in a expedient and professional manner. Our crew for cooling tower installations is completely in house, maintaining a single source your project. Tower Tech Services’ scope of work is limited to and specialized in cooling towers. Hence, we utilize our knowledgeable and experienced resources and crews to provide a fast, efficient, and expert installation or replacement of your cooling towers, resulting in a professional installation with minimal, if any, downtime. Additionally, we can replace coils or complete sections of your cooling tower in lieu of full replacements. 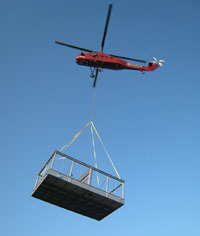 TTSI will also field assemble a packaged tower onsite if a crane or helicopter is infeasible due to the tower’s location. Such instances include downtown high rise buildings with street closure, city, and infrastructure complications, and cooling towers built into a buildings structure or parking garage which prevent access. Tower Tech Services also routinely assists mechanical contractors and owners in installing, rigging, assembling, and other facets of a cooling tower installation. Tower Tech Services also installs sand filters and centrifugal separators to maintain and clean cooling towers and condenser water loops. This includes installation of sweeper piping with high flow educators and spray jets in the cold water basins of the cooling towers.